My Terelj National Park page: overview, pictures, accommodation, how to get there. Ghorkhi Terelj National Park is close to Ulan Bator, very pretty, easy to reach, and has good tourist facilities. 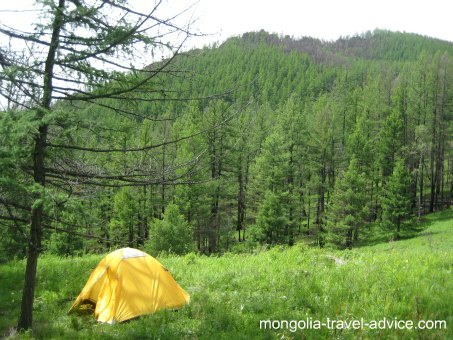 It's a beautiful park and an ideal destination for those with only a short time in Mongolia. The southern edge of the park is quite touristy, but most people stay confined around this area, so those keen for some solitude will find it remarkably easily. Our camp. On this trip, we just took the bus up from Ulan Bator, hiked a mile off the road, and camped by ourselves on a somewhat steep hillside. Perfect! While the southern fringes of Terelj has some rolling, grassy hills typical of Central Mongolia, most of the park consists of steep, wooded mountains and dramatic rock formations. The Southern part of the park -where a sealed road goes through- is very accessible, but the majority of the park is quite rugged and remote: experienced (or guided) hikers can get into some serious back country out here. Terelj is perfect for those with a short time in Mongolia, such as those on a 4-day Trans-Siberian stopover, as it contains a number of Mongolia's best offerings in a small, accessible package. Scenery, wildlife (elk, moose, bear! ), horse treks, rafting, trekking and camping can all be very easily arranged here. Terelj's proximity to Ulan Bator ensures that it's quite popular with Mongolians and foreigners alike. The road between the park entrance and Terelj township is practically lined with yurt camps for visitors. The town itself has a few hotels, but the town can get rather noisy during summer and most people will find the yurt camps quieter and more pleasant. 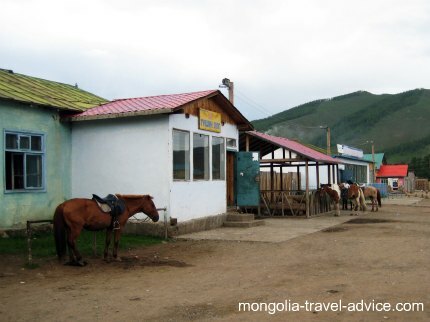 If you're in a sociable mood, bring a bottle of vodka and most locals will immediately welcome you for a drink -getting drunk (which is what tends to happen) with holidaying Mongolians could be a genuine, memorable cultural experience for you. The yurt camps also offer meals and drinks (some even have beer on tap! ), so it's actually quite easy to just arrive in Terelj with little preparation and have an enjoyable time. If all this sounds a little too touristy for you, there's nothing stopping you taking a tent and heading off on foot or horseback into the Park proper to enjoy the magnificent wilderness all to yourself. Make sure somebody knows where you're going; if you're not an expert hiker or rider, it's probably a good idea to take a guide: getting lost in the park could be fatal at worst, or at best inconvenience a whole bunch of people compelled to rescue you. The steep, wooded mountains of Terelj National Park: a nice view to wake up to in the morning. About 75km north-east of Ulan Bator, Gorkhi Terelj is easy to reach. A public bus leaves daily at 4pm from the centre of the city at Durven Zam on Peace Avenue, which is just a few blocks west of Sukhbaatar Square. It then winds it's way up the steep road into the park, taking about 2 hours. It's one of those rare instances in Mongolia where public transport is relatively comfortable and easy to use; you can have the bus drop you at any yurt camp, but if the driver drops you off at the wrong spot you might have to haul your bags back down the road. Make sure you keep a careful eye on your belongings if you take the public bus. Travelers can also simply flag down a Taxi in UB if you are in a hurry, it will cost about US$35 one way. This could be a good option for those with only a short time in Mongolia (e.g. on business, or jumping off the trans-Siberian for a few days) and is a lot more straightforward than taking a public bus, but take the usual precautions with taxi drivers. Those who choose a taxi or bus and the 'DIY' approach will save money, but obviously are without a vehicle during their stay. You can make do by hitching on the numerous vehicles heading up and down the road to town (some will charge you, some won't), riding on horseback, or good ol' fashioned walking. Tour operators in Ulan Bator offer one or two night packages in Terelj National Park, with everything included. They'll typically put you up in a ger camp and be able to drive you around the (relatively limited) tracks within the park for some sightseeing. Ask about the itinerary: if you're keen to amend it so you can take some time out trekking, horse riding, etc., don't be afraid to ask. If they aren't flexible, you can always just 'stay on' and forgoe the ride back to town so you can spend an extra day or two beyond the tour. If you haven't arranged transport back to Ulan Bator (or choose to stay on after a tour), it's very easy to hitch a ride back to the city. Just about every vehicle is headed somewhere in UB; as with most developing countries, it's always easier to find a ride to the capital than from it. The main road to Terelj town is easy enough to hitch on. Those on organised tours will be driven around to the more accessible parts of the park, but the best way to see the park is by foot or on horseback. Most of the yurt camps offer horse treks, if yours doesn't you'll likely be offered one by locals in the town or as you walk along the road. Rides cost about US$8 an hour, but you can negotiate a full day rate for not much more. Most foreigners just take a short ride around, but if you're interested in (and equipped for) an overnight ride or a multi-day ride, just ask! If you decide at the last minute that you want to camp out, ask one of the locals and there's a decent chance they'll be able to find something for you. Terelj township: a one-horse town, but good for stocking up on food, or having a beer or three. The township of Terelj has a couple of hotels, a bar/restaurant for a drink, and a shop where you can buy groceries and some basic clothing such as gloves, hats, etc. for camping. There isn't much else to draw you here, but if it's during the peak season in July/ August and you arrive one night with a thirst, odds are you'll meet some like-minded folk (foreign or Mongolian) and have a great night socializing until the wee hours. Practically every tour agency in Ulan Bator offers a Gorkhi Terelj National Park tour. Shop around, make sure you ask what kind of accommodation is on offer, whether food is included, and what you'll be doing each day (horse riding, driving around, trekking, etc.). Tour agency's also organize rafting trips on the Tul River. This river is your best bet for a Mongolian rafting trip if you only have a short time in the country. Given the park's elevation, most rafting trips start near the township and wind their way out of the park. You could raft the whole way back to Ulan Bator if you have a mind to. You can hire some rafting gear in Ulan Bator, but it won't save you much money beyond going with a tour company, who will organize all the equipment and ensure there'll be somebody to pick you up at the landing point. It's easy to go on a pleasant, short walk in Ghorki Terelj National Park, but stray far from the road and things become very rugged. The trees and hills crowd in, so visibility here is far less than on the open steppes. Getting lost is a danger for those on longer walks, so make sure you have a decent map and compass if you want to camp on your own. Brown Bears (i.e. the Asian cousin to the Grizzly!) are in remoter parts of the park. Bear attacks are extremely rare, but are much more likely to happen at the beginning of the winter thaw, when they come out hungry and aggressive after hibernation. If you want to go camping un-guided in or before May, ask the locals about the dangers and they'll tell you where it is and isn't safe to go. Bears typically strive to avoid humans but will attack if surprised, so make plenty of noise if walking through thick vegetation. If camping out in the remoter parts of the park, cook your food at least 5 meters from your tent so it doesn't get filled with tasty odors. Those who are extra-cautious (or worried!) can use a rope to string their food supply up a nearby tree. Mosquitoes are supposed to be horrendous in mid-summer; I visited in early June and it was fine, but I always carry some effective repellent (i.e. contains DEET as the active ingredient) when camping in Mongolia, and you should, too. If camping in mid-summer, be extra careful that you don't start a forest fire. 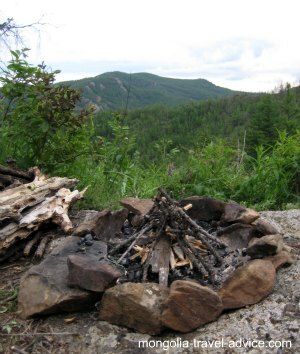 Light fires in a protected area or dig a small pit to ensure the wind doesn't blow live ashes. Ensure there's no dry vegetation around your fire and put it out properly -with water if possible- when you leave.